The electromagnetic valve gear with its fully variable valve control is perhaps the most promising technology for increasing the efficiency, reducing exhaust emissions significantly and therefore reducing fuel consumption on petrol driven combustion engines. Compared to conventional valve lift with a camshaft, a multitude of additional adjustment parameters such as load control method, exhaust gas return and valve operating mode are available with electromagnetic valve gear. Furthermore, there is also the option of cylinder deactivation. Experts calculate that a potential fuel saving of between 8% and 9% is possible using this technology. 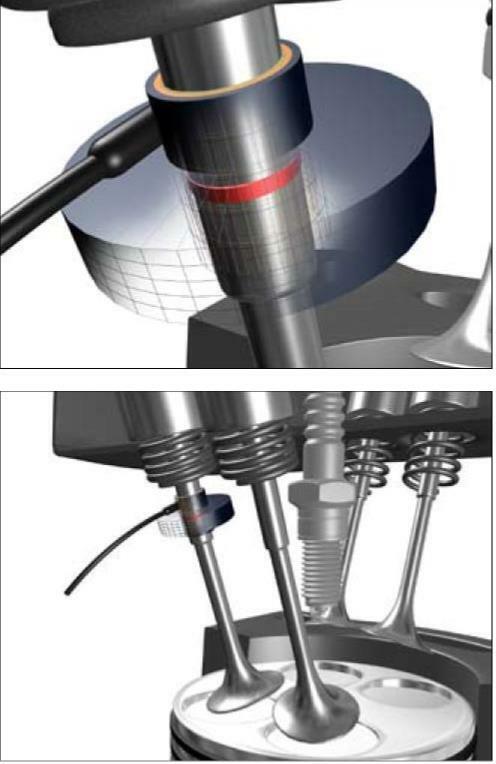 Engine valves with electromagnetic valve gear are controlled by electric actuators instead of conventional aspirated engines that use a camshaft. This means that the camshaft can be completely dispensed with. Not only is each valve controlled individually but also the respective valve lift and valve opening duration are individually optimised. The charge cycle losses typically associated with conventional engines are largely avoided. Dynamic valve lift sensors from Micro-Epsilon are being used in combination with electric actuators for fast and reliable monitoring of valve positions in combustion engines. The valve lift sensor from Micro-Epsilon is based on a patented VIP measuring principle, which offers high resolution and linearity, high temperature stability and fast measuring rates. The VIP sensor provides a very robust mode of operation, while simultaneously doing away entirely with permanent magnets. In this way, the disadvantages normally associated with permanent magnets can be avoided and therefore a longer sensor life is achieved. The valve lift sensor operates in a non-contact method and is therefore wear-free. A small aluminium ring fixed on the actuator shaft is used as the target and moves within the sensor. The valve lift sensor can be easily modified as an OEM product for the customer and the coil is housed in a plastic or stainless steel case, depending on customer requirements.